Autumn Splendour is hand drawn & digital painting floral collection. The elements of the set are made in a whimsical but naturalistic style. The color tone is saturated, but gray shades are added. So using this design, you feel the warmth of autumn and the approaching cold of winter. Zip file contains 129 PNGs in 300 DPI. The biggest PNG has 2500×2500 px with 300 PDI, the smallest as a splash has ~ 400x600px. Also, you find inside 5 backgrounds in A3 format and 4 backgrounds in A4 format (300 DPI). The vignettes have ~3000x800px. All the elements are supplied in raster PNG, 300 dpi format. PNG files can be opened with most photo editing software, but for designing Adobe Photoshop is required. For opening PSD files Adobe Photoshop CS6 is required. If you’re a graphic artist taking care of multiple projects concurrently, you, like no others, see the importance of the entire bunch of design elements available at hand. Searching for those components one at a time, you may spend much more time and expense . To obtain all of the essential elements in a single pack, we highly recommend experimenting with graphic package deals. A bundle can be described as a collection of components required for graphic design, priced at a large amount of money, however offered at a bargain price for a very limited time. 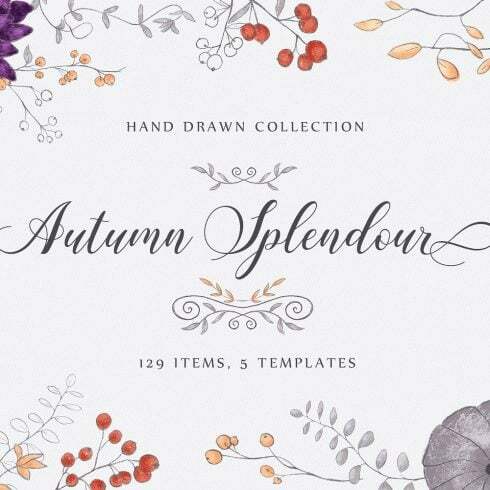 Any ways to make Autumn Splendour: 129+ Hand Drawn Elements deals even more affordable? You can make the MasterBundles items more affordable. If you share this web page via social websites – you automatically get the 5% discount for the graphic packages you like. That is a super easy way of getting a professionally created tools for less money. What types of Autumn Splendour: 129+ Hand Drawn Elements are there? 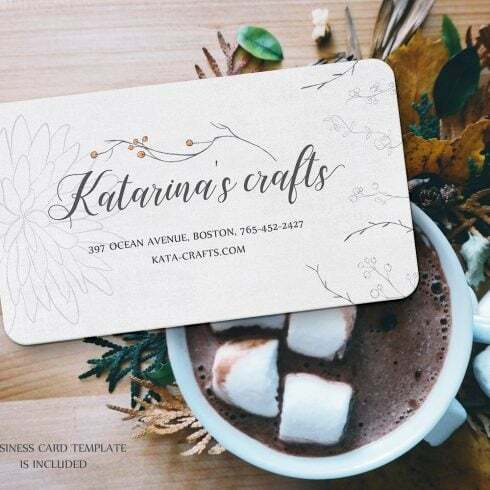 Since all the deals are different from one to another, each individual graphic designer will find the required collection for any unique project. Researching them you’ll find the collections including illustration swatches, social media infographics, PPT templates, plus much more. At MasterBundles.com , there are over 450 graphic bundles to select from. That said, you’ll not have even an opportunity to get away from the website empty-handed. How can you benefit from using Autumn Splendour: 129+ Hand Drawn Elements? The benefits of graphic deals for web designers are quite evident. But if you are a newcomer to those elements and now have concerns, the subsequent info will be helpful for you. Including a large number of the components in a single package, the selection provides you with a chance to use different of them for a number of projects. Besides, the price is often greatly reduced which lets you save some cash, yet receive the entire set priced at hundreds of dollars. Besides graphic design bundle deals, you’ll find a massive range of various other bundles on MasterBundles.com. The packages of logo templates, icons and fonts are out there at your disposal. Furthermore, you’ll find bundles of WP templates, courses and e-books, cv templates, presentations, and other elements. Another package deal also suitable for photo designers as well belongs to photo deals. Here on MasterBundles you will discover a bulk of goods for photo treatment. When you need photo overlays, PS actions, Lightroom presets, or any other tools for dealing with photos, you have come to the best place. What is Instagram templates bundles? Living in the online and digital age, all of us spend one half of our everyday life within social platforms like Instagram. Whatever purpose we attempt to achieve on this platform, we would like to be noticeable in a giant crowd among countless alike accounts. By using top quality Instagram design templates sold at MasterBundles.com, you don’t need to devote eternity building the outstanding look of your Instagram page. Articles on blogs that have infographics are far more legible than those that do not. A specialized package for infographics is most effective as it gives a ready-made solution. The designer only has to mix the illustrations and there you are! The infographic is all set. Whether you feel as if you have lost track of time while searching for various resources and elements for your design tasks, it is a high time to understand more about MasterBundles. This is a marketplace offering the most widely used instruments (graphics, icons, logos, presentations, fonts etc.) for web designers, marketers, and web developers at an affordable price for a short period of time. What’s more, you may use discount coupons and promo codes for particular design deals. To not miss major updates about the future promotions, we advise reading our blog and signing up for the newsletter.